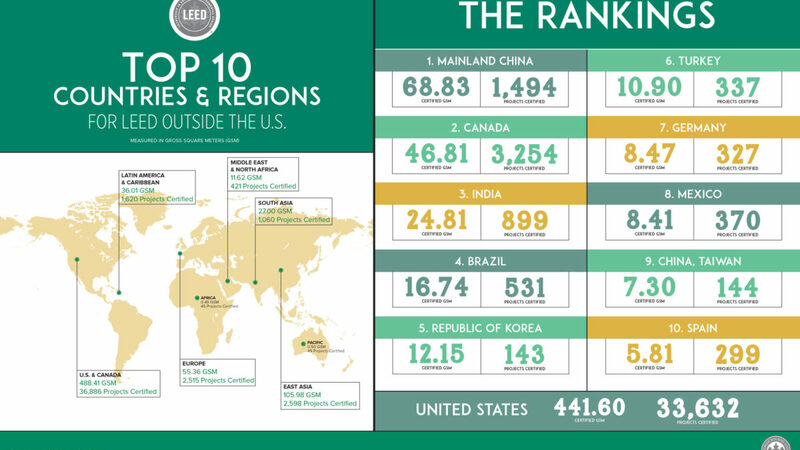 Which countries and regions top the list for LEED green building? 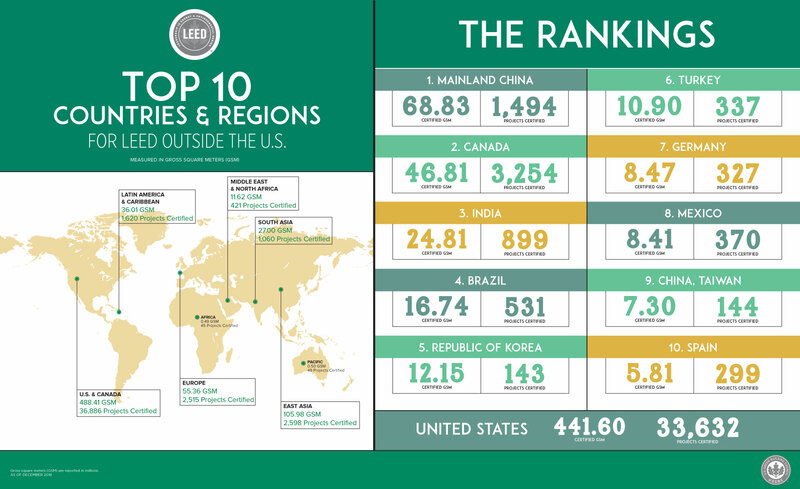 In February, the U.S. Green Building Council, the creators of the LEED green building rating system, announced the annual Top 10 Countries and Regions for LEED, outside of the U.S.
Mainland China topped the list with more than 68 million gross square meters. 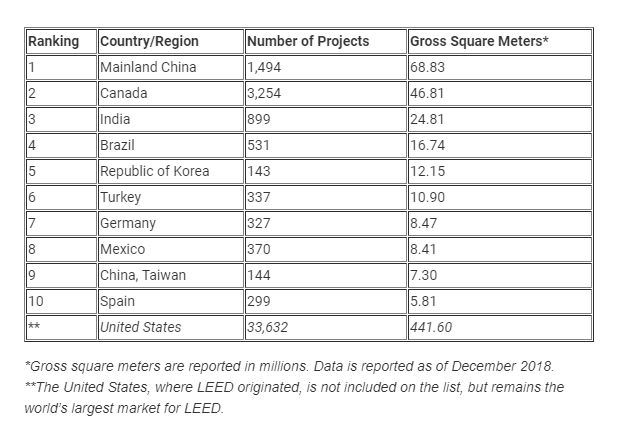 The list recognizes markets that are using LEED to create healthier spaces for people, as well as use less energy and water, reduce carbon emissions and save money for families and businesses. The top countries and regions account for nearly 7,800 certified buildings and more than 210 million gross square meters of space. LEED is a recognized symbol of excellence around the world and continues to raise the bar in terms of sustainability for buildings, cities and communities. Recently, USGBC introduced LEED v4.1, the latest update to the rating system, and released beta versions for existing buildings (LEED v4.1 O+M), new construction (LEED v4.1 BD+C) and interiors (LEED v4.1 ID+C). LEED v4.1 emphasizes human health and integrates performance metrics powered by Arc to encourage ongoing tracking. Recent research shows green building will continue growing through 2021. Client demand remains the top reason to build green in the U.S. and occupant health and well-being emerged as the top social factor. Through LEED, USGBC pushes the market toward higher performing buildings that also improve quality of life. The impact of buildings, cities and communities on people continues to be a priority for USGBC and across industries. In an effort to expand USGBC’s global green building efforts and ensure that LEED is not only the most widely used leadership standard, but also the pre-eminent living standard, USGBC launched the Living Standard campaign. Focused on the belief that storytelling can lead to a more sustainable world, the campaign aims to highlight stories – big and small – that capture how USGBC, LEED and other sustainability programs are raising the quality of life for people around the world. By visiting livingstandard.org, individuals and companies can participate in the campaign and submit stories.